Kindergarten mini books are a quick way for children to explore new ideas and enjoy stories. Sending the books home after using them at school, let’s parents share in their children’s new knowledge. Besides developing literacy skills, mini books are also useful for prompting children to think about and understand the concept of sequence. Children put the pages in the correct order, either by looking at the page numbers if they are able or by predicting what comes next. Also use mini-books to focus students’, attention on the structure of a book, the title page, the beginning, the middle, and the end. 1. Keep finished kindergarten mini-books legible! Some kids scribble all over the pictures and the words. Put aside a bucket of crayons or felt markers for mini-books with the black, dark blue, purple and other dark colored crayons removed. When children use the dark colored crayons or felt markers for coloring mini-books, the darker colors cover the words and make the text hard to read. Some children love this type of activity and others hate it. Kids are really only practicing coloring, cutting and assembling at this stage. Don’t pressure the ones who are not into coloring. The real value of mini-books comes when children read them alone, together as a class, with a friend or buddy and/or at home with their siblings or parents. 2. Make a “Mini-book of the Week” center. Put a colored, completed mini book and real or toy objects that go with the story on display in the center. Read the mini-book to the class on Monday and Tuesday. Get kids excited about the story and talk about concepts and vocabulary they may not be familiar with. By Wednesday, the children will be eager and ready to make their own books. Read them as a group on Thursday. Send the books home on Friday. 3. Expect a learning curve when children first begin assembling the books. Make extra copies as children will cut in the wrong places. Teach children that the dotted lines are for folding and the solid lines are for cutting. Not all mini-books are assembled the same way and some are more difficult to put together. Be sure to make one before you ask the children to! 4. Assembling the books is a lesson in itself. Some children will find this more difficult than others. 5. When you photocopy a mini-book, photocopy one book a lot larger. “Go to page 3 in your book. It looks like this one. Now find and color all the letter “p”s with a yellow marker. to have confidence, as the books are short and do not overwhelm young children. review vocabulary as they color the pages. the reproducible books are photocopy ready and also have extension activities. they are easy to send home for at home reading with parents. Below are thematic mini-books that are written to engage emerging readers. They have simple, predictable stories with appealing artwork that supports the text and will help students build reading skills. Topics include mini stories as well as nonfiction books about penguins, friends, plants, the seasons, and more. They come complete with easy, step-by-step directions and teaching tips. For use with Grades K-1. These twenty-five stories contain simple, predictable language and illustrations that support the text. It has cross-curricular spin-offs and literature links. This set of books, written to go with Guided Reading Level A, are just right for beginning readers. The simple, stories on favorite topics such as birthdays, pets, friendships, and favorite foods include high-frequency words, rhyming and repetition. Help children build reading skills with this collection of stories that give them practice reading words from 25 different word families. Each book uses a few simple rhyming words to tell a lively and funny story. Includes ready-to-photocopy pages and extension activities. For use with Grades Pre K-1. Flip books, shape books, step books, accordion books, plus more for emergent readers! Favorite topics take you through the school year: seasons, holidays, animals, and more. Great for send-home reading practice. For use with Grades K-2. Sight Word Mini-books – These have no cutting or stapling. They just fold and they’re ready to use. These reproducible books give emergent readers plenty of practice reading and writing each of the top 100 sight words. Each mini-book teaches one high-frequency word and features an engaging rhyming poem that kids complete, then a word search to reinforce learning. It also has teaching tips and extension activities. This set of nonfiction mini-books help children boost comprehension skills, expand vocabulary, and learn important concepts about nonfiction topics such as neighborhood and community, families, transportation, animal homes, plants and seeds, weather, and more. In English and Spanish on each page. The little books below feature high frequency words, rhyming, repetition, predictability, and supportive illustrations that encourage young children to become independent readers. For use with Grades K-1. 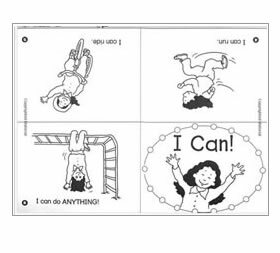 The following set of mini-books is designed to help students learn how to communicate effectively, make good choices, and practice appropriate behavior. Shopping from Canada? Go to Amazon.ca to find the books above. Sign up to get kindergarten-lesson updates delivered to your inbox and get a free copy of “10 Steps for Using Recording Sheets in the Classroom” as a thank you. Some links on this site are affiliate links (mostly the Amazon Services LLC Associates Program), which means that if you choose to make a purchase from them, I will earn a small commission. This commission comes at no additional cost to you. I recommend them because they are helpful and useful. Please do not spend any money on these products unless you feel you need them or that they will help you achieve your goals.